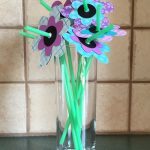 No matter what the weather is outside, the kids will have fun making these pretty Button Spring Flowers. 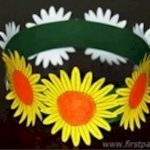 You can change the buttons and the color of the craft paper to make other varieties of flowers, real or imagined. Color your mini craftsticks green and glue heart buttons (heart bumps facing each other) to another clothespin. Clip heart button clothespin to colored craft stick. Punch out circles from your card stock paper. Place button clothespins around the circle. Glue tip of craft stick onto back of card stock circle.